Calvin on Predestination and Election is an important excerpt from his masterwork, Institutes of the Christian Religion. 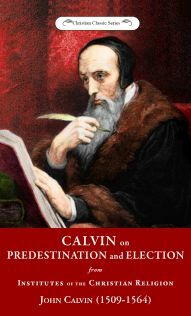 Of all the concepts in theology, predestination and election are the ones most often associated with John Calvin’s name. For both the reader new to Calvinistic thought and the scholar, this serves as a most useful explanation of a difficult subject—a subject that must be clarified amidst great confusion in our day. Calvin explains the doctrines, expounds their impact on grace and works, and refutes major objections. Man is humbled; God is exalted! If you are unfamiliar with Calvin when you begin this reading, you may be a proponent by the time you complete it. This is a reprint of chapters XXI-XXIII from the 1559 edition of John Calvin’s theological masterwork, Institutes of the Christian Religion, Book 3, translated into English in 1845 by Henry Beveridge. The publishers desire to introduce the Institutes to a modern generation of readers. Therefore, we have undertaken careful improvements in the punctuation and minor editing of the translation while remaining true to the meaning of Calvin’s original. “Part One” of this reprint is from chapter 21 in the original, “Part Two” is from chapter 22, and “Part Three” from chapter 23. The editors have added many definition footnotes.